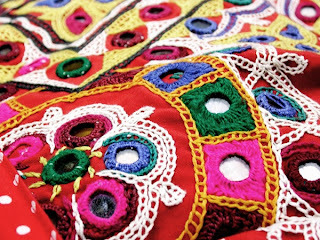 After weaving of a fabric comes the additional adornments in the form of embroidery, sequins, tassels and other such trimmings. The art of embroidery involves the use of needles and thread or yarn to create intricate designs on cloth. 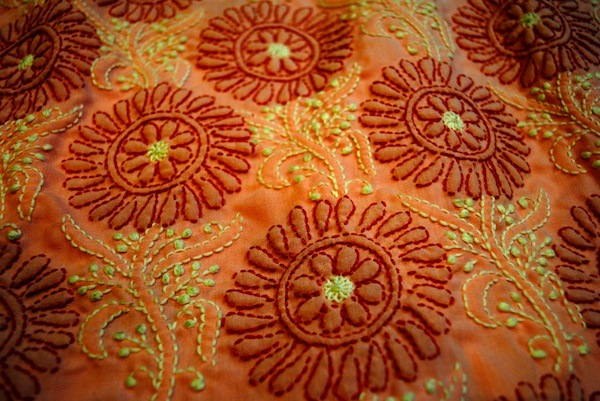 Here are some embroidery styles from India, that you can incorporate on your wedding wear! Phulkari – This handicraft originated in Punjab and literally means “flower working”. The darn stitch is skillfully used on natural khadi to create motifs horizontally, vertically or diagonally across the fabric. 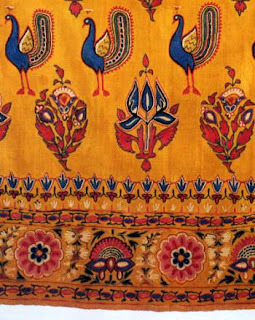 The main characteristic of Phulkari embroidery is the darn stitch used on the wrong side of the fabric with the design taking shape on the front. Chaddar, Bagh and chope are three types of phulkari work. The “Chope” is a red colored dupatta with phulkari embroidery done only along the edges and is presented to the bride as part of the wedding ceremony. 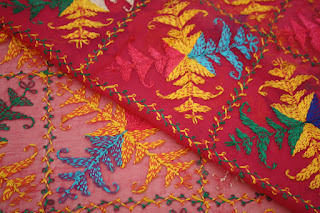 The “Chaddar” or “Suber” is a red shawl used by the bride during her pheras and has 4 motifs embroidered in each corner and one in the centre of the shawl. A fabric entirely covered in phulkari work is called a “Bagh”. Chikankari – Lucknowi Chikankari kurtas are very famous worldwide and are a must have in a bridal trousseau. In this style, the pattern is first block printed on the fabric, after which the lines are filled with colorful threads. These designs are usually crafted on light weight fabrics such as cotton, linen, georgette and chiffons giving it a lacy, breezy feel. Intricate filigrees and floral patterns impart a delicate quality to these designs. Kantha – This art form is native to West Bengal and stems from a necessity more than a hobby. Originally, Kontha, the Sanskrit work for rags, essentially involved recycling of old, worn out silk and muslin cloths which were arranged in layers and thread obtained from old sari borders is used to stitch the layers. The embroidery consists of a basic thread sewn in simple running stitches to produce intricate and beautiful designs. Apart from sarees and dress materials, the Kantha embroidery can also be seen on bed covers, table line, wall hangings, upholstery and curtains. Zardosi – Zardosi literally means “sewing with gold” and is originally a Persian art form. It involves creating designs with gold, silver and colorful metal threads. 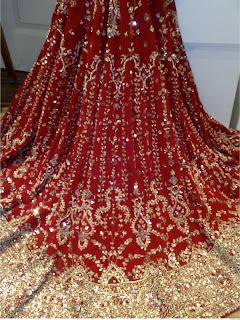 Lehengas and saris with intricate and heavy zardosi work look stunning and are a popular choice for bridal wear. The effect of this embroidery is enhanced by the use of sequins, stones, glass and metallic beads, brocades and motifs. These fabrics are generally very expensive due to the intricate work and use of gold and silver zari. Mirror work – The embroidery of Rajasthan and Gujarat, displays a distinctive use of colorful threads, appliqués and mirror work. In this style, small mirrors or reflective material are incorporated into the design and are held in placeby a framework of stitches sewn around it. This form of embroidery is versatile and is found on purses, accessories, wall hangings, home furnishings and other decorative items.